In the manufacturing process of one particular small medical plastic part, the company was faced with a parts separation challenge. Thirty to forty hot plastic parts connected to long, stick-like runners exit each injection molding machine at a time. Prior to packaging, the small plastic parts need to be separated from the runners and conveyed downstream. Historically, employees were responsible for separating the parts from the runners, which required a considerable amount of time. Additionally, the conveyor system contributed to poor yield and quality issues such as part distortion resulting from pieces getting caught under the side rails of the conveyor and contamination from belt particulate. 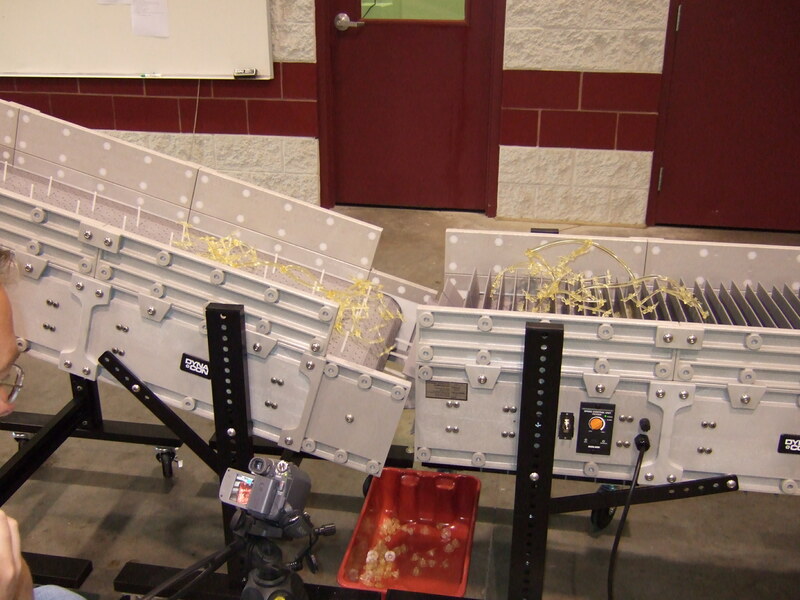 Dynamic Conveyor developed a novel solution for the application utilizing three DynaCon modular conveyors. The solution works in the following manner: The first conveyor is equipped with drive flights. When the hot small plastic parts and runners exit the molding machine, they land on this conveyor. While the small plastic parts fall into the spaces between the flights, the runners rest neatly on top of the flights. Following the first conveyor is a lift pin separator conveyor. As the first conveyor discharges to the second conveyor, the plastic parts in between the flights fall down between the conveyors and onto a third, up-feed conveyor that deposits the finished parts into a box. The runners, meanwhile, are captured by the lift pin separator and are carried away to the grinder. Since installing the Dynamic Conveyor parts separation solution, the customer has significantly reduced their labor requirements. Employees no longer need to manually separate the parts from the runners. The greatest gain for the company, though, has been a significant increase in output due to the new parts separation system. “We were able to shave one second off of the press cycle time, and this has so far resulted in a $90,000 savings attributable to increased output,” said the Engineering Manager.